Executive family home in this sought after cul-de-sac. There is a stunning Fraser Valley view from the living room with french doors to a balcony. The elegant Maple kitchen has a walk-in pantry, and adjoin s a spacious family room. Master bedroom with big walk-in closet and full 4 piece ensuite backs onto the forest. A secure high speed LAN is wired throughout the house with cable and phone lines too. The ga rage is huge, and is insulated and heated. The basement has a separate entrance, huge rec room, 2 bedrooms and soundproofed ceiling. The house is custom built with 2 X 6 construction, skylights in the entr y and kitchen, and oversized hot water tank. The rear yard features a stampled concrete patio, with a covered barbeque area off the rear door. The landscaping is terraced and stepped up to a lookout/sittin g area with outstanding view. 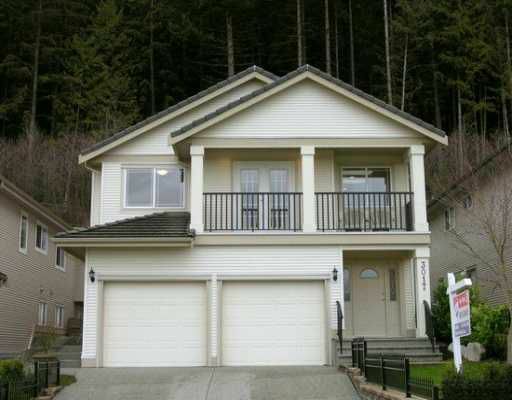 This property backs to forested parkland with walking trails covering Ridge Park, but is only 5 mins from all of the shopping & services of Coquitlam Centre.